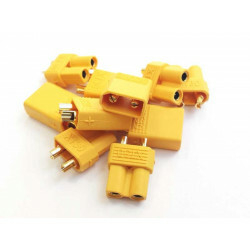 We offer many different types of RC Connectors including Deans, XT60, XT90, 2mm Gold Bullets, 3mm Gold Bullets, 3.5mm Gold Bullets, 4mm Gold Bullets, 6mm Gold Bullets, HXT Connectors, EC3 Connectors, EC5 Conectors, JST Connectors, Micro Deans, MT60 Connectors, Multiplex MPX Connectors. If you need an RC connector that is not listed then let me know and I will source them for you. 10 Sets of JR style Servo connectors for making your own servo leads or repairing damaged servo lead..
10 Sets 2 Pin JST (BEC) Connector Housing And Pins1 pack contains-10 Red plastic MALE JST (BEC) Conn..
1x 3.5mm HXT Bullet Connector W/Housing 16AWG10 cm in length, female/male bullet connector with red ..
Amass XT90 Anti-Spark Connectors.2 pairs of XT90S Anti Spark Connectors and 4 soldering covers to ke..
Deans (female) to Mini JST (Female) Adapter.A handy converter cable, joined using 22awg wire.1x Fema..
Deans style connector Male+Female with 14awg wire 10cm1x Male 1x Female connector with 10cm 14awg wi..
Deans T Plug Parallel Adapter Connector x1The Deans T plug Parallel adapter is a handy way of runnin..
EC3 Connectors 3.5mm Male and Female.Sold as pairs, packs of 5 and packs of 10 (see options to the r..
EC5 Connector 5 PairsThese connectors are the same as the EC3.5 but instead of using 3.5mm connector..